These chiles have a nice and strong, true Thai chile heat. Fresh pick. Red chiles are excellent in tom kha soup. and our very popular recipe Pla Rad Prik. They also make the best nam pla prik. An unusual twist: try our Killer B Red Thai Chile Peppercorn Cocktail. Available on a seasonal basis, we are currently shipping immediately a very fresh batch. See our entire selection of fresh Thai produce here. 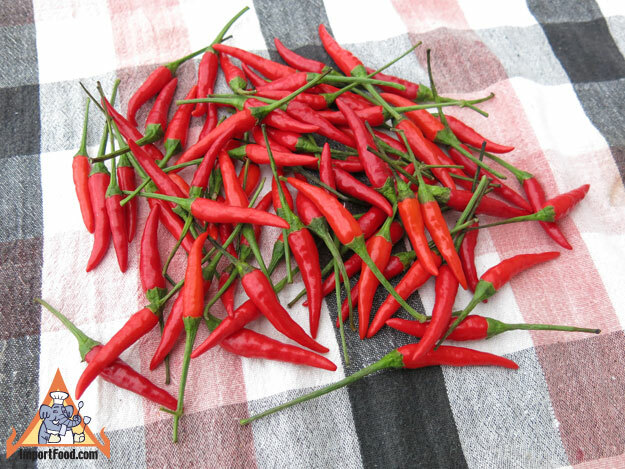 Also, we know of at least two home-brewers of hot sauce use our fresh red chiles every year. You might like to try making some of your own, these would be the best chiles to use. Here's one of our recipes for home made hot sauce. We'll ship all fresh produce via expedited 2-3 day Priority to ensure freshness. They freeze ok, for longer storage. This is a very spicy crispy fish that's surprisingly simple to make using just a few ingredients. It's best to use fresh red Thai chile peppers. Regarding the fish, here we used tilapia you can use any fish such as cod, catfish, trout, salmon, etc. We had the fish cleaned and gutted but left the head on. You may prefer to remove the head, or even use fish fillets -- it doesn't matter. Note that when you've finished frying your fish, put it in the oven at 350F for 10 minutes or so as you prepare the sauce, as this will make it even more crispy. We like making several dozen at a time then storing uncooked rolls in the freezer in a ziplock bag. Make your own all natural hot sauce that's free of preservatives using the best fresh ingredients! On a seasonal basis, usually May - September, we have beautiful fresh red chile peppers that are loaded with a mature, strong heat but also some notes of fruity sweetness. These are perfect for making your ownsriracha sauce. This is a lot of fun to make, because you can adjust the flavors at the end to suit your preference. The hot sauce starts out very, very hot, so be careful. If you prefer a milder sauce, use 50% red bell peppers, jalapeno, or a more mild fresh pepper.